Drilling a new sports crag, especially a steep one, is harder than doing the route itself sometimes, though it has its training benefits - holding a 6kg drill against a wall of rock leads to biceps like giant bubble wrap. I'd rented a drill for a weekend and with a good forecast was determined to drain the batteries and get as many holes in as possible. But I forgot the golden rule of bolting... take all your trad gear, I mean ALL of it! You tend to end up using so many clippers, krabs, bits of tat and old ropes that it turns into a full aid climbing expedition. I abbed down the wrong line first, didn't bring my shunt and had to do it all over again. Then I couldn't tension the old wall rope tight enough to pull in - it bellied out like an elastic band and left me spinning in the air, drill whirring round my kneecaps. At one point the sling slid over the drill trigger and it went for my kidneys, I screamed and pushed at the murderous thing like being attacked by a monster mosquito. Which wouldn't surprise me in this dense forest of crags... beasts everywhere, and I've only got two months before the bracken, Jurassic ticks and midgies stop play. The project is harder than I thought, but I got closer than I expected, managing the first crux match though tiny quartz crimps. 7b up to this point and this B6c sequence leads to a clipping pocket and good finger edge, but the wall is steep and the footholds tenuous. The top wall is fierce and harder than I thought, one long stretch too much for me at present, but it may go before the 'beast arrival'. 8a in my book at present, but we'll see, it always tends to drop a grade with familiarity. I'll release the whereabouts of 'Quarterdome' once completed... there should be a handful of new routes between 6a and 8a. During a pumped lull in working the sports routes at Marlena, Mike disappeared off with his shoes in hand seeking something amenable to solo in the rhododendron wilderness. He appeared back an hour later with a 'pretty good' boulder problem project instead. Hard, he said. Okay, I thought, Cave Crag and its environs are not renowned for the generosity of bouldering, but what a little gem! Having eventually refound the problem, his radar having gone astray, Mike pointed out a beautifully scooped groove with two obvious holds on the right and none on the left, sloping ledges and a rounded top-out - the perfect boulder problem: not quite enough but maybe just enough. Numerous plays later he returned to the sports crag, still psyched but beaten for the day. Adrian Crofton, the bullshitting teuchtar, sent us off on a wild goose chase for a 'nice scooped boulder on a little meadow'. We found a chossy overhang on a bog. Meanwhile, Nic was cruising up Silk and inexplicably tossing himself off Marlena, still, looking strong and fluid after just having repeated Sufferance the day before. Not to be outdone by the youth, Guy Robertson was cruising up Hamish Teds for warm-ups before despatching Silk Marlena, despite forgetting the sequence at the top and receiving bad beta from the dangling photographer. 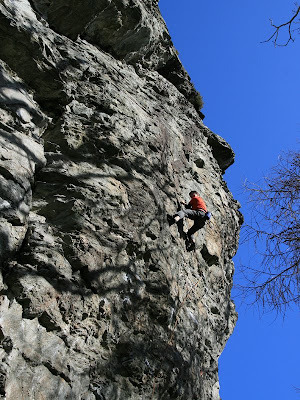 Second session and the stamina is returning... off to bolt a new Loch Lomond crag today. 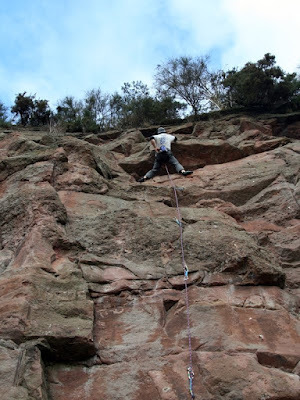 By Monday we should have a new venue to add to the burgeoning list of sport climbing crags in Scotland, and more to add to the upcoming Stone Country Bloc Sport guides. Viewing the crag from Dunkeld on the first visit in spring, it always looks intimidating: a towering mass looming over Dunkeld - to me a grey-white page from the book of failed redpoints. So it was I returned midweek to my nemesis: 'Marlena', as the warm spring winds and sun dried out the weeps. This route was originally climbed consecutively by Dave Cuthbertson and Murray Hamilton in late summer 1986, with nothing more than the odd bolt, pegs and wires for protection. Colin Lambton texted me to say it was the 20th anniversary of his repeat in 'original clothing'. Since those dizzy days of headbands, stretch lycra and hairy-arsed boldness, it has been climbed thousands of times by visiting climbers, though most come a cropper just below the chain. This is where a notorious technical sequence 'deep in the pump' spits off wannabes in furious wrath. In 2009, I resolved to get it done before a looming turn of personal decades... I felt nowhere near fit enough, though I was strong enough for any of the moves, but it's such a long, complex rubric of sequences. Finding the ability to rest and recover on it is crucial - if you can't recover at the junction jugs, lap Hamish Ted's instead to build up the required stamina. 1. Right foot edge on and boost RH to Gaston, up left to good hold, RH up to another press. 2. Cross over LH to the lower of double gastons, RF on slopey hold. 3. Up to LH jug and knobbly quartz jugs, clip. 4. Cross LH on quartz, RH up to good flattie, grab the bottom slot nubbin, clip underneath RH. 5. RH out to good edge, sort feet, stretch left to sidepull, walk feet over, undercling slot, up to higher LH hold. 6. High feet and up to block, shake out, clip. 7. Direct: pocket and crimp up to RH edge, lunge for bottom of flange, sort hands go again to rail, clip. 8. Handrail across and egyptian up to jugs, clip, shake out as much as you can. 9. Stretch LH to sidepull, powerful cross to higher slot in crack, clip. 10. Up to LH pinch sidepull, clip. 10. Step RF in high and step up to gaston, LF on polished edge, LH pocket. 11. RF on square edge, trail LF and crank up high to RH slot. 12. LH up to 2-finger slot, RF in pocket, LH up and high as possible to finger slot, step high, cross to chain. In a bid to liven up a new series of sport and bouldering guides, I'm looking for curious memories/histories of climbing at Scottish venues. They're just 100 word stories about humorous incidents or weird happenings, or memories of other climbers and people you met. I'm willing to give a page of each major venue in the guides to these snapshots with free copies of the guide to all those who are published, so treat it like a Cornflakes packet competition... in a hundred words or less...! Stories that are exclusive and haven't appeared elsewhere would be welcome, just keep it light and humorous, with a bit of local colour to highlight the mood of the venue. Dumbarton would be a good place, for example, as so much 'happens' there, but remote and obscure venues are fine, wherever your memory is stirred! 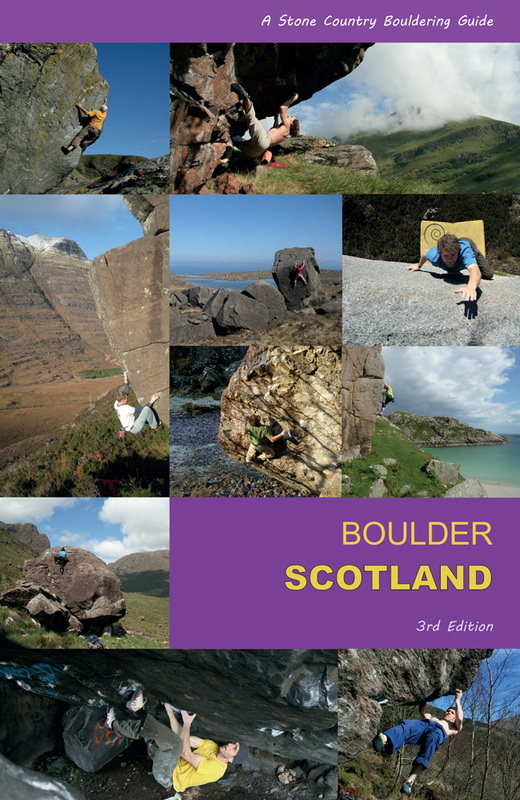 The new guides should be publsihed in batches over the next year, covering all sporting venues and more comprehensive bouldering gen than is in the main guide 'Bouldering in Scotland'. 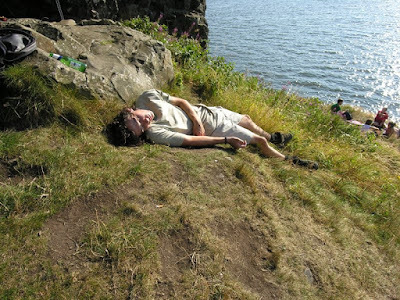 I just thought we all take it too seriously sometimes and it would be good to make the guides entertaining as well as informative, after all the best thing about climbing is telling the story in the pub afterwards. Just email anything to me here. This time of year naturally seems to see the most psyched and virulent spell of training, with the longer days stretching our anticipation and the usual eternal optimism of the Scottish climber that this year is going to be a blinder - better train for it! Getting up to speed with the sport climbing is the usual priority and in March the crowds descend on Hamish Ted's... Is there a more popular sports climb in Scotland? I doubt it. Personally motivation to train means I have new things to go at. Plus a three week bout of flu and migraines have left me desperate to get out or at least to train with a view to these big stones and walls awaiting the sending winds and blue sky days. As an inveterate hunter of boulders, I have a few plums tucked away in some very obscure places, though some are not so remote and I pass on as many as I keep to myself... I'd rather see folk enjoying new rock where I know the climbing is beyond me. So watch out for a few pointers soon on this blog, I'll unload a few big stones with grid refs. 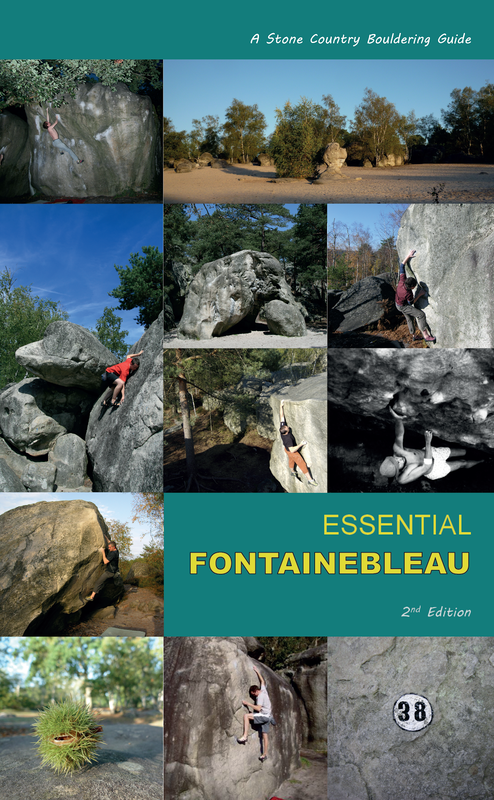 This year, as I struggle to get back into the harness and train to some degree of competence, bouldering is taking a back seat. I'll be touring round the sports crags and big walls of Scotland with a view to the next few publications from Stone Country.